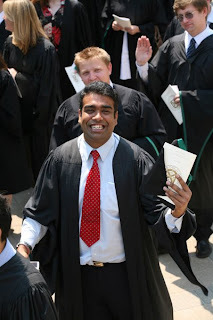 The day was May 24th, 2007- the day I graduated from the Queen's MBA program. It was also my parent's wedding anniversary day, and they were there at Kingston to attend my graduation. To top that, it was the day I received three awards at the MBA program - Derek Russell Award for Excellence in Operations/IT, the Noranda Sales Corporation/William G. Deeks Award for Excellence in Strategy and the Tom Burns MBA prize in International Business. so where have you landed after a year? Wow.....This is truly your moment under the sun ! Keep that going strong....All the very best. wow...really great. keep it up for your ahead life. all the best. Thank you. So this will favorably help students to initiate with more of the regarded proceedings which are indeed considered and said to be important for them.